In the AMIGO suite, we have developed a new surgical approach for treatment of small lung nodules, lesions that are not obviously malignant, but could harbor early lung cancer. If surgical resection is warranted, these lesions are often difficult to palpate, necessitating a large resection of lung tissue to ensure that the lesion is completely removed. Our protocol utilizes the intraoperative fluoroscopy and C-arm CT capability of the AMIGO suite to place image-guided fiducials around these small lung lesions and improve the precision in localizing the lesions. The protocol has enabled our precise targeting of lung tumors and minimizing the extent to which normal lung tissue is resected while achieving adequate surgical margins. With the recently developed guidelines for screening smokers with low-dose CT, many more small lung nodules are expected to be detected. The successful development of our surgical approach using the AMIGO suite could prove highly beneficial to patients with these lesions. Image-guided targeting of lesions for surgical resection is not a new concept. However, many current techniques are without the benefit of fiducial placement with intraoperative fluoro-CT, relying, instead, on preoperative image guidance or on intraoperative ultrasound guidance. These techniques are associated with the risk of complications and the limitations of image resolution. Our surgical approach in AMIGO utilizes C-arm CT image guidance in a controlled operating room setting. It is designed to maximize patient safety while using C-arm CT imaging to target small lung lesions so that pathologic lung tissue may be completely excised while preserving as much normal lung tissue as possible. Lung cancer remains the deadliest malignancy. The National Lung Cancer Screening Trial found that screening smokers who fit the criteria using low-dose CT has a significant impact on reducing mortality. The screening detects with precision many small lung lesions and our new surgical approach has demonstrated safe and effective preliminary results for excising these lesions with precision. We plan to continue evaluating the long-term outcomes so that our surgical approach can be translated for use in other clinical settings. 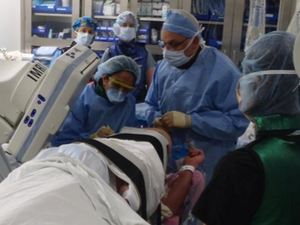 Hybrid operating rooms like the AMIGO suite are becoming more prevalent. In clinical setting without this technology, our surgical approach may be adapted for use with preoperative CT image guidance to place the fiducials marking the small lung lesion. This case study below illustrates the iVATS workflow in AMIGO. A 20-year-old male was diagnosed with a small lesion in the right lower lobe of the lung. 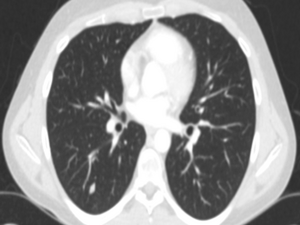 Preoperative PET-CT showed a 9 x 7 mm lung nodule that was also visible on PET imaging. Localizing such a small lesion by finger palpation intraoperatively is almost impossible, and so an entire lobe of a 20-year-old patient would have had to be removed. The patient underwent an iVATS procedure in AMIGO. Using the techniques we developed, we were able to accurately localize the lesion intraoperatively under C-arm CT guidance using two imaging fiducials called T-bars. Thereafter, using these two fiducials as surrogate markers for the tumor, the surgeon identified the lesion and performed a wedge resection surgery. Pathology results confirmed that the lesion was a carcinoid and the margins were negative. 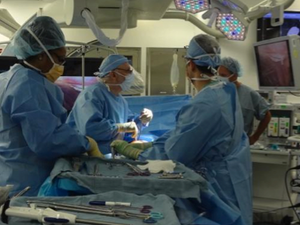 Video Assisted Thoracoscopic Surgeries (iVats), A news article and video by Dr. Mallika Marshall, WBZ-TV Medical Reporter. July 18, 2014. 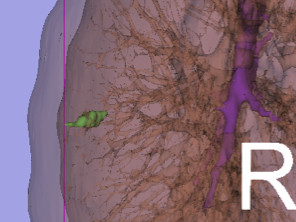 PURPOSE: To facilitate localization and resection of small lung nodules, we developed a prospective clinical trial (ClinicalTrials.gov number NCT01847209) for a novel surgical approach which combines placement of fiducials using intra-operative C-arm computed tomography (CT) guidance with standard thoracoscopic resection technique using image-guided video-assisted thoracoscopic surgery (iVATS). METHODS: Pretrial training was performed in a porcine model using C-arm CT and needle guidance software. Methodology and workflow for iVATS was developed, and a multi-modality team was trained. A prospective phase I-II clinical trial was initiated with the goal of recruiting eligible patients with small peripheral pulmonary nodules. Intra-operative C-arm CT scan was utilized for guidance of percutaneous marking with two T-bars (Kimberly-Clark, Roswell, GA) followed by VATS resection of the tumor. RESULTS: Twenty-five patients were enrolled; 23 underwent iVATS, one withdrew, and one lesion resolved. Size of lesions were: 0.6-1.8 cm, mean = 1.3 ± 0.38 cm.. All 23 patients underwent complete resection of their lesions. 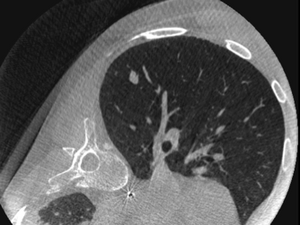 CT imaging of the resected specimens confirmed the removal of the T-bars and the nodule. Average and total procedure radiation dose was in the acceptable low range (median = 1501 μGy*m(2), range 665-16,326). There were no deaths, and all patients were discharged from the hospital (median length of stay = 4 days, range 2-12). Three patients had postoperative complications: one prolonged air-leak, one pneumonia, and one ileus. 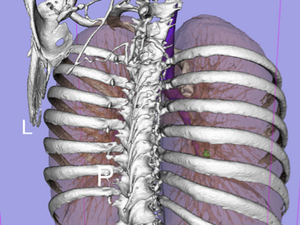 CONCLUSIONS: A successful and safe step-wise process has been established for iVATS, combining intra-operative C-arm CT scanning and thoracoscopic surgery in a hybrid operating room.